Energy markets will be closely monitoring events in Syria this week. On Saturday, the US and allies France and the UK launched limited missile strikes against targets inside Syria, in response to the Assad regime’s suspected use of chemical weapons. Trading in Asia Monday morning saw ICE Brent crude oil futures give up some of the gains built up last week. OPEC and non-OPEC ministers will meet in Jeddah, Saudi Arabia, on Friday to discuss the latest data on the oil market. On the agenda will be the prospects for extending cooperation beyond the expiry of international production cuts in December. Elsewhere, the aluminum and alumina markets are likely to remain volatile due to US sanctions against Russian oligarchs close to President Vladimir Putin. Across Europe, the weather is turning warmer; which may pull down prompt European natural gas contracts this week. Adding to the downward pressure is the end of several Norwegian outages. Finally, the shipping industry will be mulling the implications of Friday's announcement by the IMO of a strategy to tackle the industry's greenhouse gas emissions. Our social media question for this week: Have energy markets priced in geopolitical risk? Tweet us your thoughts with the hashtag #PlattsMM. In this week's highlights: traders expect a bearish week for European gas; US sanctions on Rusal are expected to continue unsettling aluminum markets; and the shipping industry will be digesting the IMO’s proposals on reducing greenhouse gas emissions. But first, let’s focus on the Middle East. Energy traders will be closely monitoring events in Syria and the Middle East this week. On Saturday, the US and allies France and the UK launched limited missile strikes against targets inside Syria, in response to the Assad regime’s suspected use of chemical weapons. Trading in Asia Monday morning saw ICE Brent crude oil futures give up some of the gains built up last week. 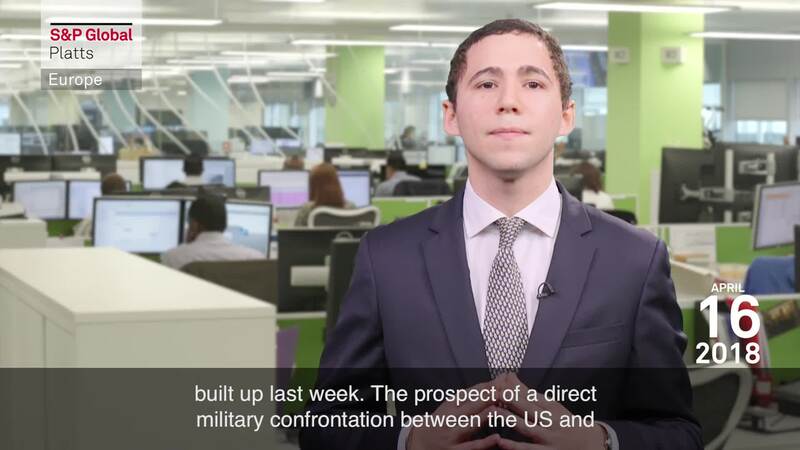 The prospect of a direct military confrontation between the US and Russia over Syria had previously pushed oil prices to a three-and-a-half year high, going above $72 per barrel. Both Russia and Iran are backers of the Syrian government and have forces in the country. Traders appear to have been comforted by the idea that the Syrian intervention was targeted and a one-off. Any further news from the region and the White House this week will be closely watched. Against this turbulent backdrop, OPEC and non-OPEC ministers will meet in Jeddah, Saudi Arabia, on Friday to discuss the latest data on the oil market. On the agenda will be the prospects for extending cooperation beyond the expiry of international production cuts in December. Meanwhile, Middle East tensions and the potential US military intervention will also hang over the discussions. This leads to our social media question for the week: Have energy markets fully priced in geopolitical risk? Tweet us your thoughts with the hashtag #PlattsMM. And it is not only the energy markets which are caught up in political turbulence. The aluminum and alumina markets are likely to remain volatile due to US sanctions against Russian oligarchs close to President Vladimir Putin. The sanctions mean metal from the world's second-largest producer, Rusal, is effectively locked out of the US market and no longer deliverable on key futures exchanges. Rusal is controlled by Oleg Deripaska. The entire aluminum supply chain is now scrambling to evaluate the risks of handling the company’s exports. Concerns over tightening supply caused London Metal Exchange aluminum prices to hit six-year highs last week. While geopolitics may be returning to the Cold War era, in Europe the weather is turning warmer. This might pull down prompt European gas contracts this week. Adding to the downward pressure is the end of several Norwegian outages. Those outages had previously been affecting flows to the UK and to the Dutch/German border. However, the end of the heating season could slightly offset the bearish elements by triggering higher injection rates across Europe. Finally, the shipping industry will be mulling the implications of Friday's announcement by the IMO of a strategy to tackle the industry's greenhouse gas emissions. The IMO’s plan requires the industry to reach peak greenhouse gas emissions as soon as possible and reduce them by at least 50% from 2008 levels by 2050. It also requires carbon dioxide emission cuts per voyage, as an average across international shipping, of at least 40% by 2030—and the industry is pursuing efforts towards a cut of 70% by 2050. To the relief of many in the industry, the EU welcomed the IMO’s move. The EU had threatened to include shipping in its emissions trading scheme if it was not satisfied with the IMO's approach. However, the EU cautioned that while the deal was a good starting point, it was crucial that effective measures were adopted swiftly and put in place before 2023. Another question on the shipping industry's mind will be how the greenhouse gas cut strategy will affect plans to implement the IMO's 0.5% sulfur cap on marine fuels in 2020.